​A selection of Riihimaki’s Starburst vases in three sizes. The tallest stand around 11 to 11½ inches, depending on the top shaping. The middle size vase is a little shorter, around 9 to 9½ inches. Both of these feature a repeated (double starburst) motif. The small Starburst vases stand around 5 inches high. ​Colours are blue, amber, marigold and pale pink. ​​It’s fascinating to see Carnival Glass advertised in old newspaper ads: they reveal the history of the glass in a fascinating way, as if we were living it for ourselves. Until now, we have only been able to use American, Australian, Canadian and British ads – but thanks to Roger Peltonen, we have an amazing insight into the introduction of Carnival Glass by Riihimaki. The date of the first ad was April 1928. This was almost certainly when Riihimaki began making Carnival, calling it their Hoh’to-Lustra glassware range. Above left is an ad in Swedish, from the April 6th 1928 edition of ”Hufvudstadsbladet” (a newspaper for Swedish speaking people in Finland) and on its right is the same ad, in Finnish which appeared in the June 2nd 1928 of the ”Suomen Sosialidemokraatti” (The Finnish Social Democrat). Below is the same text but with a different illustration – this appeared in the local Riihimaki newspaper, the ”Riihimäen Sanomat” on April 22nd 1928. Grateful thanks to Roger Peltonen. Roger has kindly provided us with this translation of the text in these ads. ​”Riihimäen Sanomat” ad on the left. Here it is in blue Carnival. ​It is a challenge to identify all of the items shown in these newspaper ads. In the top two we can see part of what appears to be a Western Thistle vase to the left of the large central vase, while the deep bowl to the right of centre is surely a Starburst and Crown bowl. ​The other items are not so easy. ​There’s a different set of pieces shown in the ”Riihimäen Sanomat” ad, and more of them can be identified. In the very centre is the beautiful Sunk Daisy. The tall pitcher on the right, along with the stemmed comport (sugar) and small lidded bonbonniere, are in the pattern known as Laurel Band, which is called Kara by Finnish collectors. Roger Peltonen tells us that “the pattern was named ”Kara” because the moulds are believed to have come from the factory ”Karan lasitehdas” (1918-1921) which also produced glass in the town of Riihimäki. 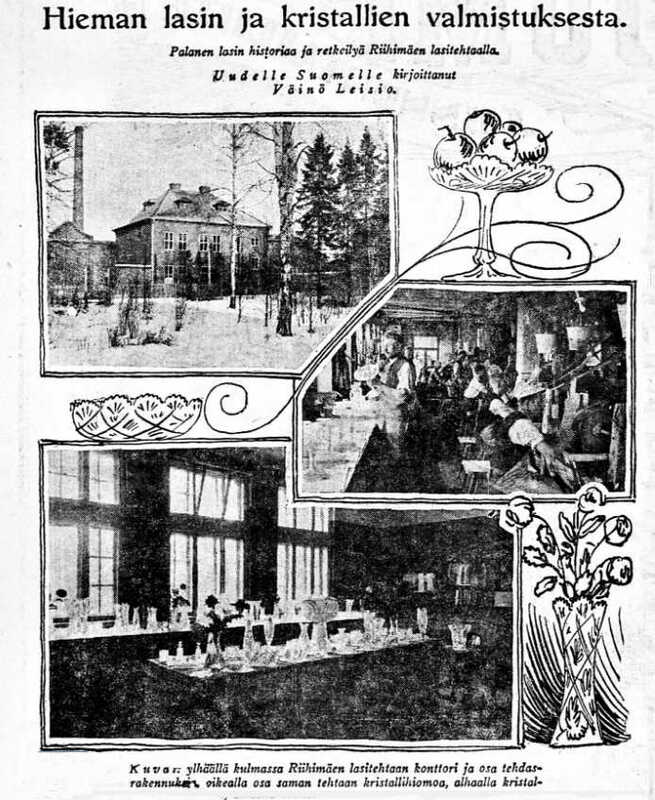 After Kara´s bankruptcy the Riihimäki glassworks bought this competing factory in 1922. The other patterns are less well known, and indeed some are not yet known at all in Carnival. The creamer and stemmed sugar on the right are called “Palmu” but we are not currently aware of them in iridescent glass. 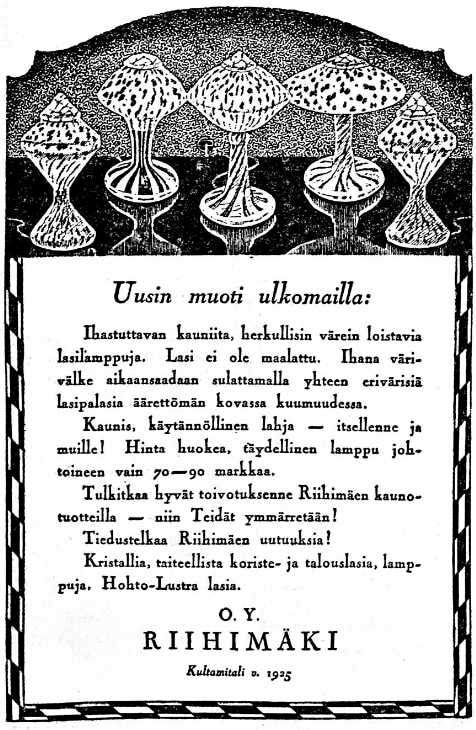 It’s interesting to note that when Carnival was first made by Riihimäki it appears to have been called Hoh’to-Lustra-lasitavarat by the company in their advertising: roughly translated this means Glowing Iridised Glassware. “Hoh’to” was very possibly the colloquial name given to Riihimäki’s Carnival. Some twenty years later, the name Punahohto, meaning red glow (surely marigold) was also used by the company. It’s interesting to see how Riihimaki advertised itself or was promoted in the newspapers in other ways. ​lamp shades, and all forms of lighting. windows, mirrors and other glass for furnishing. ​At the bottom of the 1923 ad is an address in Helsinki where their glass could be seen. In fact it appears to be where the famous department store, Stockmann, was located. The image above shows Stockmann in Helsinki in 1920. We know that Stockmann sold Riihimaki’s glassware, so it’s very likely that Riihimaki’s glass would have been on show and for sale, in the store at that time. This 1923 article had some interesting photos of Riihimaki. Riihimaki also promoted their lighting range. ​This amazing ad is from December 1928. ​The small ad (above right) is from 1929 - it was for a lamp (lighting) shop in Turku, Finland (Abo is the Swedish name for Turku). Engraved glass, art glass and Carnival Glass (lysterglas) from Riihimaki, Karhula and Koklaks, were advertised as specialities. It’s interesting to note that the ad is written in Swedish. Turku is officially a bilingual city, as many of its inhabitants speak Swedish as well as the mother tongue, Finnish. Note also that Koklaks is listed alongside Riihimaki and Kathula as producers of the glass being sold. Please see our e-book “Carnival Glass from Riihimaki, 2nd edition” for much detail on Koklaks. The factory was founded in 1923 – it was explained in our e-book that we believe that Carnival was first made in Finland at Koklaks circa 1923-7. The discovery by Roger Peltonen of two Carnival items bearing the moulded Koklaks name is vital evidence for that belief. Koklaks became a subsidiary of Riihimaki in 1927. 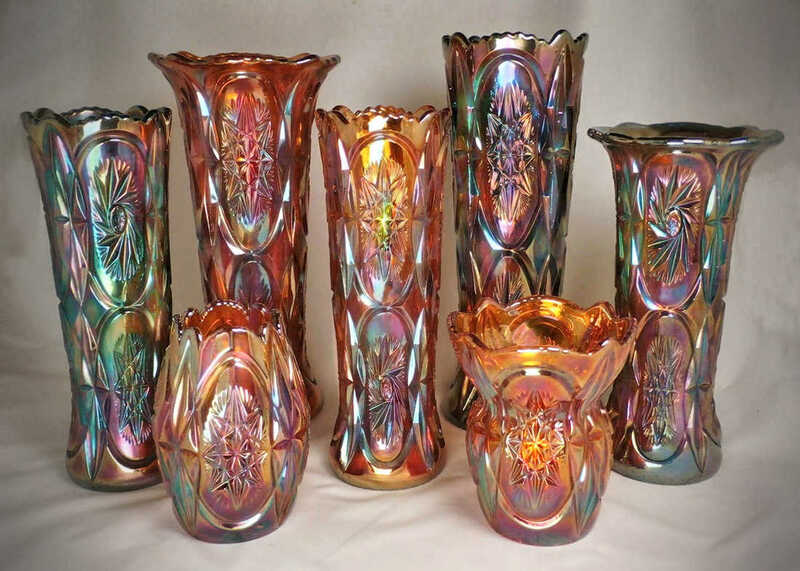 Read more about Riihimaki and their Carnival Glass - follow the links from our Riihimaki Hompage.